It’s been an amazing 9 days! 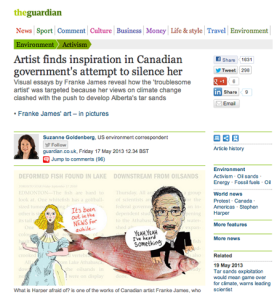 Canadian media are now picking up on the story which Suzanne Goldenberg at the Guardian UK broke on May 17th: Artist finds inspiration in Canadian government’s attempt to silence her. Goldenberg’s article has been “liked” on Facebook over 1,676 times — and continues to spread the news of the Harper Government’s attempts at silencing me around the world. 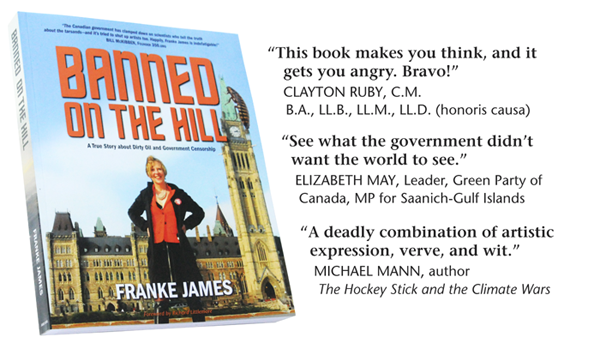 103 funders on Indiegogo have pitched in from Canada, the USA, the UK and Belgium. As of today, we’re just $274 away from the $5000 goal… Can we exceed our goal and take the campaign across Canada and to the USA? 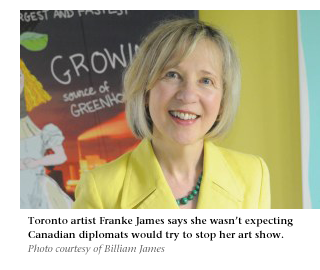 “More than two dozen senior officials and diplomats in Prime Minister Stephen Harper’s Conservative government monitored information about a Toronto artist over her criticism of the oil and gas industry’s environmental performance. 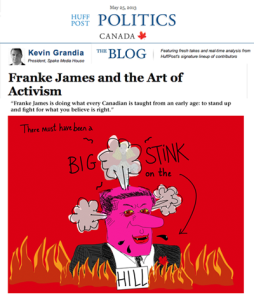 “Franke James is doing what every Canadian is taught from an early age: to stand up and fight for what you believe is right. Franke has turned her art, her story and her activism into a visually stunning book, Banned on the Hill: a True Story about Dirty Oil and Government Censorship, and on Monday her book got international attention with a feature in UK’s Guardian media outlet. Like the poster? You can buy it as a perk — in the BIG 47 x 68″ size, or the smaller 12″ x 18″! 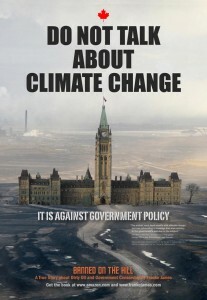 The outdoor posters “Do Not Talk about Climate Change” are now made and going up on the streets of Ottawa very soon. The “Do Not Talk about Climate Change” ads continue running on The Hill Times, and ran for one week on Rabble. Have you got your perk yet? The perks are being sent out, but it’s a big job so please be patient. 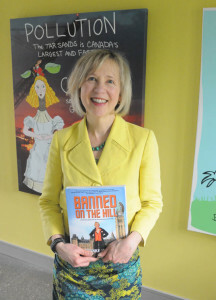 Some people have already received their Banned on the Hill print book… However if you’ve asked for a signed book it will be a few more weeks as I have not received my bulk shipment yet! The tattoos and the 12 x 18 posters are still in production, and will be sent out when they are available.